In this article, we are going to look at the best wok burner for outdoors use. As someone who has spent a fair bit of time in Asia especially Thailand I have seen wok burners in action many times. The road-side chefs who cook up delicious and healthy fast food in seconds were an inspiration for me to take a look at my buying options back in the West. While I love good old American BBQ [You can’t beat a good steak!] I do like experimenting with different styles of cooking outdoors and cooking Asian Stir Frys on high heat in a wok is great fun. 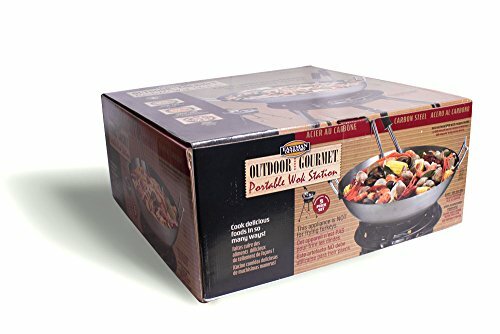 1.1 What are the Benefits of an Outdoor Wok Burner? 1.2 What Wok BurnerTo Buy? What are the Benefits of an Outdoor Wok Burner? If you’ve cooked at high temperatures indoors you will know for sure how much smoke can be produced as well as splatter from oil. Cooking Outdoors saves all the mess, clear up and smokey atmosphere. Any Asian Chef will tell you cooking at high heat produces the best results. The burners we recommend are 54,000 BTU and up so you can fry at high power. You will find that your oil heats up to smoking point within seconds of firing your burner up. Cooking at these temperatures makes sure that the meat or vegetables are cooked right and not just boiled in their juices which is what happens if you use a regular stove as it does not get hot enough. Cooking in your wok outdoors is great fun and you can replicate your favorite Asian recipes or use its versatility to steam or fry fish or seafood as well. We have found three dedicated wok burners that are well rated on Amazon. We have given an overview and details of each one with the pros and cons. This is probably the most popular and lowest priced outdoor wok burner available online. This outdoor wok kit is comparable to the Texsport but at a lower price – once again you get a 54,000 BTU propane burner, an 18-inch carbon steel wok and two wooden cooking utensils. We liked the added feature of the Recessed top ring that makes sure that the wok stays in place and is secure on the burner. Some reviewers described the wok as being light weight but it is thin gauge by design as this helps with heat transfer. One reviewer mentioned that if you wanted to add a griddle to the King Kooker that the Char-Broil 7186193 Big Easy Smoker Roaster Grill Cast Iron Griddle is a perfect fit. The King Kooker should easily be able to cater up to 8 persons. If you are looking for a more powerful outdoor wok burner the Eastman 37212 boast a 65,000 BTU burner. It also comes with an extra large 22 inch wok so you can cater for larger groups of people. While the Eastman is higher priced than our previous two recommendations as well as being more powerful and having a larger cooking area it does have some other benefits as well. For instance, there were comments from customers regarding the King Kooker and Texsport products being fairly low to the ground so that if you were tall you had to stoop. The Eastman has adjustable legs and a special flip over surface that can either hold a large pot for boiling or the wok. Not a deal breaker but it also comes with a stainless steel wok spoon, spatula and thermometer. The Eastman 37212 is currently being sold at around twice the price of the previously mentioned wok sets but it is more powerful, bigger and more stable. If you are planning on going big for your cookouts this could be for you. If you are happy to buy a separate wok the portable Kahuna burner comes highly recommended for its versatility. It can it be packed up an stored away very easily or folded down to be transported to camping trips or tailgating events. It can hold an 18 inch work and accomodate pots for boiling up to 36 quarts. This is another high powered burner with 65,000 BTU. One of the biggest issues with any steel product that is used outdoors is that it is likely to rust. To minimize this you need to treat your Wok and burner well. Keep them out of the elements and ideally cover the burner up when not in use. Make sure that you check it regularly when not in use for signs of rust. 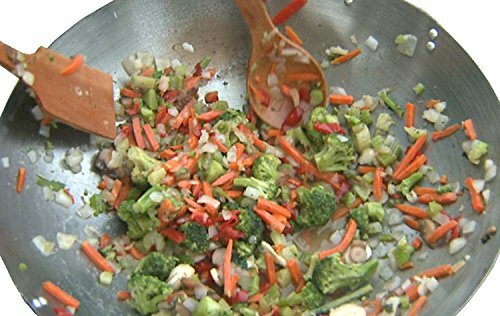 Make sure that you season the wok not just when you first use it but regularly after each time you cook with it. You are all grown ups and I really don’t need to tell anyone this but…. Cooking with oil, indoors or outdoors has its dangers. Do make sure that your burner is sturdy and on a flat surface. We also recommend a good pair of heavy duty BBQ gloves for lifting and moving the wok while it is still hot. Once you’ve decided on a Wok Burner that meets your requirements you will of course need a wok. Here are a few good picks for using outdoors. This is a really big wok so would be great if you have a lot of people to feed. Make sure that you clean and season it before use. For the size this is worth the price, it also comes with wooden cooking utensils, which isn’t a deal breaker but makes a nice extra. This is probably the Best Buy out of all the wok’s we looked at online its cheaper and bigger than the King Kooker and gets good reviews. Once again make sure you clean and season it, to get the best use out of it. This is a smaller wok but it is one of the Best Selling online and gets great reviews. Made from Cast Iron and already seasoned this wok is high quality and made in the USA. This is a heavy duty wok that if looked after will last you decades. Lodge give you detailed instructions on how to look after it so there should be no excuses. Buy a wok cover for your wok, this is great for steaming. If you are using recipes online or from books do take into account that you will need to reduce cooking times because they are usually for people cooking using a wok indoors. One cookbook that we highly recommend is The Breath of the Wok by Grace Young. Learn the proper art of ‘Wok Hay’ and try some of the delicious recipes and tips she mentions in the book. 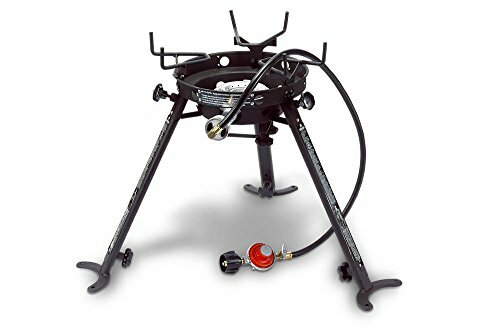 If we had to choose our top pick it would be the Eastman Kahuna Burner for its competitive price, versatility, and high power burner. Cooking outdoor is always fun and experimenting with different cuisines even more so. If you love outdoor cooker then adding a wok burner to your set up is a fantastic addition. Backyard Sumo Copyright © 2019.